St John’s Cathedral The Cathedral of St John the Baptist is the present day Cathedral in Limerick City was erected in 1856. It replaced an older Roman Catholic chapel by the same name which was erected in in 1753. Limerick, has many churches with the same name with one serving the Roman Catholic community and the other serving the Protestant community. Others include the two St Munchin’s churches and the two St Michael’s churches. This can be confusing for tourists and those trying to trace their family history. The link between St John the Baptist and the area around the St John’s Cathedral is long-standing. According to Begley, the Knights Templar had a house in the area in the 12th century that was dedicated to John the Baptist. 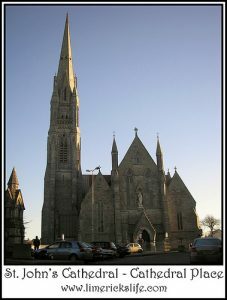 It boasts the tallest church spire in Ireland. St John’s Cathedral was designed by Philip Charles Hardwick. Hardwick was also working on Adare Manor at the time. Seventeen years after it’s opening work began on the spire, this was designed by Hennessy’s of Limerick. The bell in the steeple was carried to Limerick from Dublin, by barge using the canal systems, more information on the Limerick side of the canal can be found on the Canal Walk page. Ms. Slater, Do you know if it possible to climb the spire of the Cathedral?